Shelby says her Green Tree Frog, Chucky, is a pretty crazy frog! 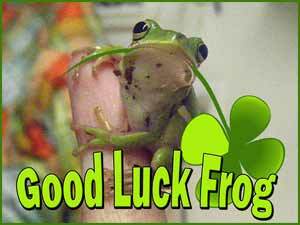 When a lucky frog comes into your life that’s a sign of transformation, and it may well spark many wonderful changes! The frog has been a strong good luck symbol in many cultures all around the world, and throughout history. Just like people, the frog undergoes incredible changes in its journey to adulthood. It first hatches from an egg into a wiggly fish-like tadpole, then it begins growing arms and legs and its tail recedes. With this curious growth cycle, frogs are seen as a lucky symbol of transformation, fertility, and the awakening of one’s creativity. They also represent save travel, abundance, wealth, prosperity, health and friendship. In Japan frogs are a symbol of Good Luck, and the Romans believed that to have a frog would bring good luck into the home. The Irish on the other hand, consider the frog as a close relative of the leprechaun, and thus very capable of playing tricks on you. The Greeks and Romans both associated frogs with fertility and harmony. To the Egyptians the frog is a symbol of life and fertility, as well as rebirth or resurrection. The frog was a creature born of the annual flooding of the Nile, which in turn made the otherwise barren lands fertile. Thus the frog-goddess of Fertility named Heget (meaning frog), came into their culture and mythology. In the Roman culture, the goddess Venus was also often depicted with a frog. Partly due to the very large number of eggs that a frog will lay, it became a symbol of abundance as well. For many cultures that depend on rain for rich and bountiful crops the frog is a good luck symbol, a sign of prosperous weather to come. In Native American tradition the frog is often seen as a rain maker. In Australia too, the native Aborigines believed frogs brought the thunder and rain to help plants to grow. To the Vietnamese the toad is the “uncle of the Sky”, and an ancient story tells that it will rain whenever toads grind their teeth. In ancient China the frog represented the lunar yin and the Frog spirit Ch’ing-Wa Sheng was associated with healing and good fortune in business. Tradition has it that the Chinese god of wealth, the immortal Liu Hai, kept a three-legged toad as a pet. It is a symbol for riches and often pictured with a gold coin in its mouth. In Native American culture, the frog is seen as a spirit animal or totem that is strongly associated with the water element and its cleansing attributes. This water connection brings emotions and feminine energies, but also cleanses physically, emotionally, and spiritually. In folklore the first frog of spring is said to bring you many friends if it does a “hop toad” jump in your direction. Although frogs and toads are mostly considered lucky, there are a few examples where they represent bad fortune. One of my favorites is the common old wives tale that says handling a toad will result in getting warts. This is believed to have originated from the toad’s bumpy skin making it appear like it has warts on it. Bad fortune is depicted in folklore regarding the first frog of spring. “If the first frog that you see in the spring is sitting on dry ground, it signifies that during the same year you will shed as many tears as the frog would require to swim away in.” Further, if that frog leaps into the water you’ll have misfortune fortune all year, or if it leaps away from you, you will lose friends. In ancient China, a frog in a well is symbolic of a person lacking in understanding and vision. Though frogs are often thought of as a symbol of luck, and mostly good luck though sometimes bad, they are also featured prominently in many cultures. They have been found throughout the ages in myths, folklore, and fairytales and they are still found today. In popular culture frogs and toads have many appearances, but the tendency is to depict them as kind, often handsome and charming, but with an underlying mysteriousness. Some popular stories for children include an early fairy tale, “The Frog Prince,” originally featured in Grimm’s Fairy Tale Classics and then later translated into English by Edgar TAylor. Then there’s Mr. Toad from Kenneth Graeme’s “The Wind in the Willows” and Tiddalik the frog, a legend in the mythology of Indigenous Australians. In the television and movie world, Kermit the Frog appeared in 1995 and became the most famous of Jim Henson’s Muppets. He became even more famous in 1979 as the star of “The Muppet Movie”. Looney Tunes Michigan J. Frog first appeared in 1955 in “One Froggy Evening”. Wearing a top hat and carrying a cane, he happily sings ragtime and other tunes. In the music world there was Jeremiah, a bullfrog, as the star in the song “Joy to the World,” written by Hoyt Axton and released by Three Dog Night in 1979. So frogs have long influenced people and there’s the good, and just a touch of bad, in the world of frog luck. Beyond the joy of keeping frogs as pets, they could very well bring changes and abundance into your life! I came home one afternoon and I went into my room and there’s was an frog clearly laying on my wall. I didn’t know why to do I was shock I haven’t sent an frog in a house since I been living never heard of it or seen it!! I have a Tulsi plant in my house which is a new comer and is growing very fast but since 3-4 days when I pour water there is a frog lying in the mud in the tub where the tree is, tried to send it away but in another 5 minutes it again came. The next day 2 small frogs came instead of the big one. Nothing good or bad happened but I think let it be there as it liked the tub in the door step of my house it will be my pet. Great article! I too found a toad in my finished basement this morning. We helped him find his way back outside where he likes it most. Thanks! I believe that a frog is a good luck! I have one small frog come to see me everytime he or she gets hungry .he use to enter the house when the door is open..its just a very small but if you touch it,the tummy will get bigger and bigger.so sometimes i hold it and talk to it and give food..when she finished the food,then gone.its because i really love animals also. I had a new refrigerator delivered today to my home, and delivery guy, who was from Trinidad originally, asked us to remove a tiny frog that attached itself to our brick outside wall! According to him, it was a bad luck! I laughed and told him to kiss a frog, and it will turn into a princess, and he would have to marry her!